So you’re the founder of Wikipedia. Your name is Jimmy ‘Jimbo’ Wales. Like the rest of us, you have relationships with other people. Only unfortunately, you have a relationship with somebody called Rachel Marsden. Trouble is, she’s a political pundit not known for her lack of controversy. So when things soured, where else to air your dirty linen but on the internet? 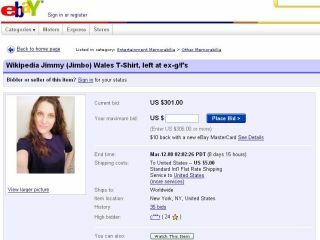 Wales struck first, using a talk page on Wikipedia to “set the record straight on a couple of issues” before Marsden decided to retaliate by auctioning a T-Shirt Wales left behind on eBay – it’s currently fetching over $300 (£150). Wales said the pair had “one meeting” and that he wanted it to be clear that he hadn’t altered Marsden’s Wikipedia bio as a special favour, but is routinely involved in complaints about erroneous pages on the site. By the time they did meet, there was clearly something of an attraction. But according to The Times there is a discrepancy in where they met. Ramsden says Wales left the T-Shirt at her flat in New York City, while leaked IM conversations (she used the Google Talk feature in Google Mail which records all your chit-chat) suggested a hotel in DC. However, it seemed Wales may not have been too fond of Marsden’s growing Google Talk library. It seems this was with good reason, since they’ve ended up on Valleywag. They’re so involved that you feel like you’re wearing somebody else’s pants when reading them. Marsden says: “You are the sleazebag I always suspected you were, and should have listened more carefully to my gut instincts” Oo-er. Marsden is hardly generous about her ex-lover: “Both of these items have been washed, twice, with Tide extra-strength liquid detergent. Otherwise, they would not be in salable condition.